Have you ever been in a garden setting and wondered how to identify a plant that you have just come across? So have I! That is where the PlantSnap mobile app comes into use. 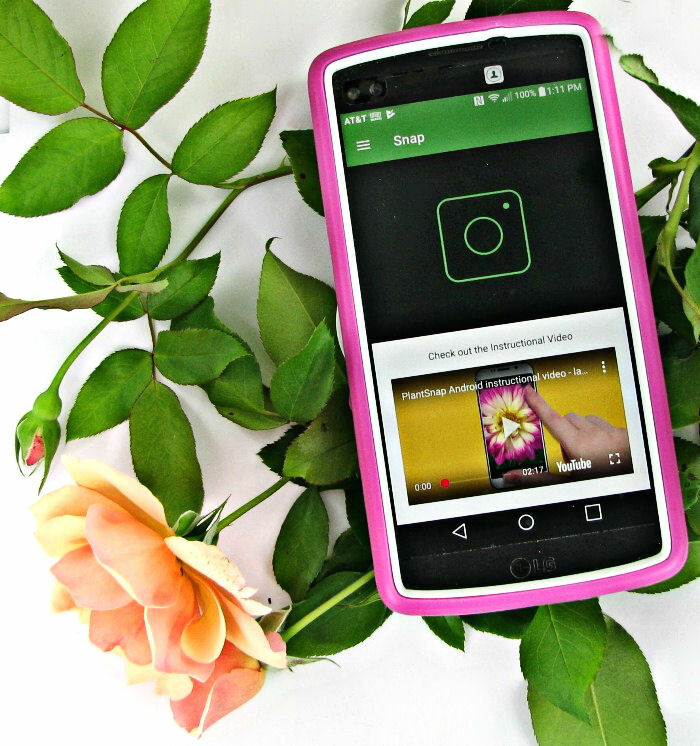 With this handy phone app, all you need to do is snap a photo of the plant, and PlantSnap will give you suggestions for the name of it! I have been compensated by PlantSnap for this post. All opinions are mine alone. 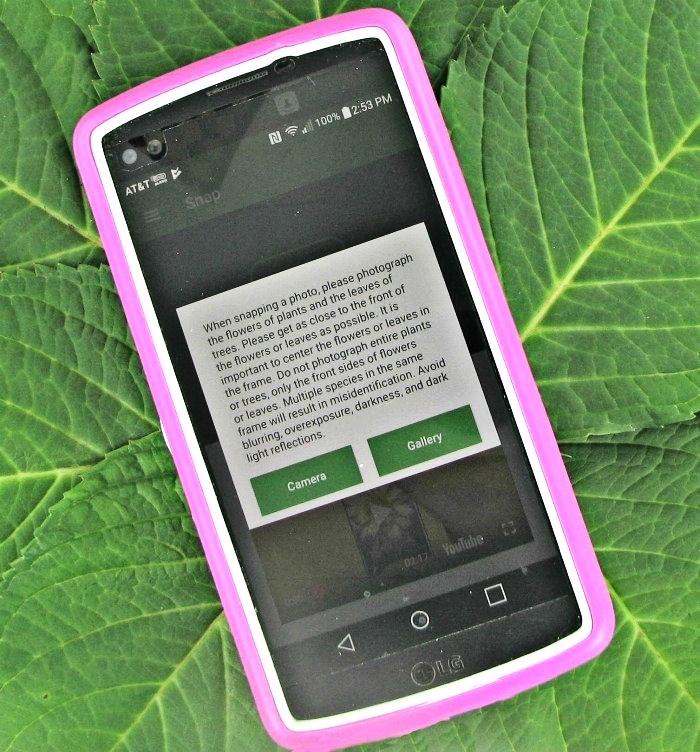 #hunting4plants It’s time to try the PlantSnap Mobile App. I recently went on a month long trip where I visited garden centers in many U.S. states in the southeast and Mid West part of the country. One would think that botanical gardens would have all the plants identified but, trust me, this was not the case for me! There were many lovely specimens with no markers at all. Being able to identify the names of perennial plants and flowers is very important to me. When I add photos of them to my blog, I like to make sure that I have called them by their true names to help my readers. Also, knowing the correct names of the plants helps me to find them for purchase if I am not already growing them in my garden. I was lucky enough to be given the PlantSnap phone app during my trip and I gave it a great workout as I toured the various botanical gardens. I used the phone on plants that were identified, on those that were not (but ones that I knew the names of) and on many that I had no idea of the name of the plant. I found the app very useful and quite accurate as long as I followed the instructions for taking the photos. I have tried other plant identification apps in the past and was disappointed with the mixed results that I got. 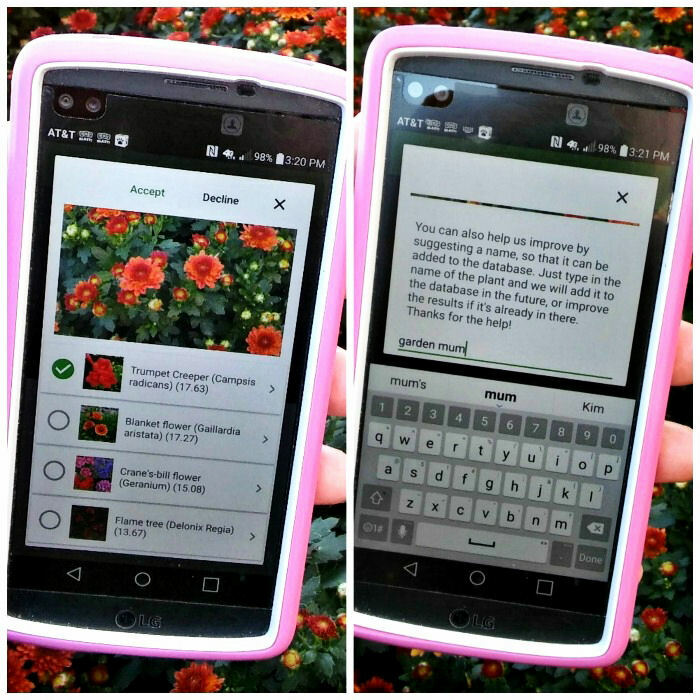 With PlantSnap, I was able to identify hundreds of plants, particularly flowers and ornamental plants, which are my main love. 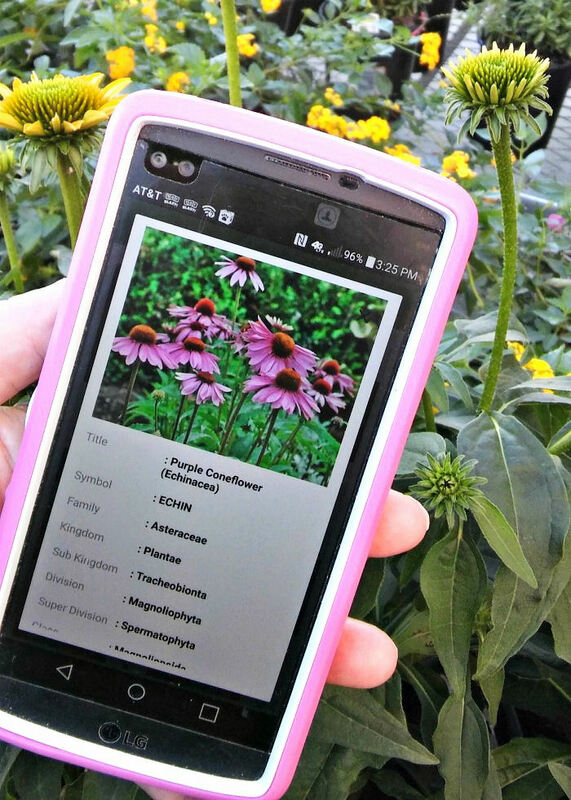 The PlantSnap mobile app will help you identify not just flowers but also plants and trees. 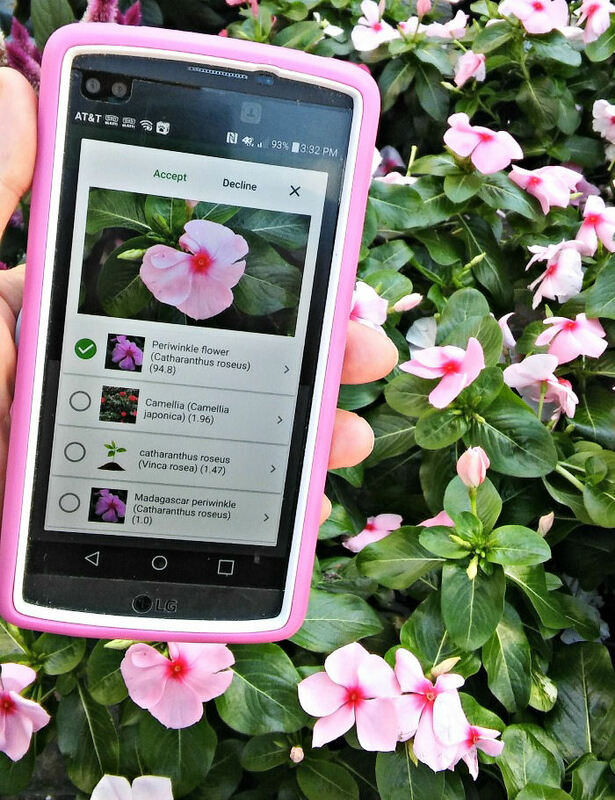 To use the app, simply snap a photo of the plant, and PlantSnap will give you several suggestions for its name, rated from most likely to least. It is great for parents and teachers organizing scavenger hunts for their children or for gardening enthusiasts trying to identify plants that they come across. The goal of the company is to fully cover almost every known plant species on Earth by the end of 2017. Don’t take a picture of the whole plant! I love that the mobile app integrates with the camera on your phone to make taking pictures easy. A quick click and you’ll be on the camera ready to take a photo. But that is not all the app will do! 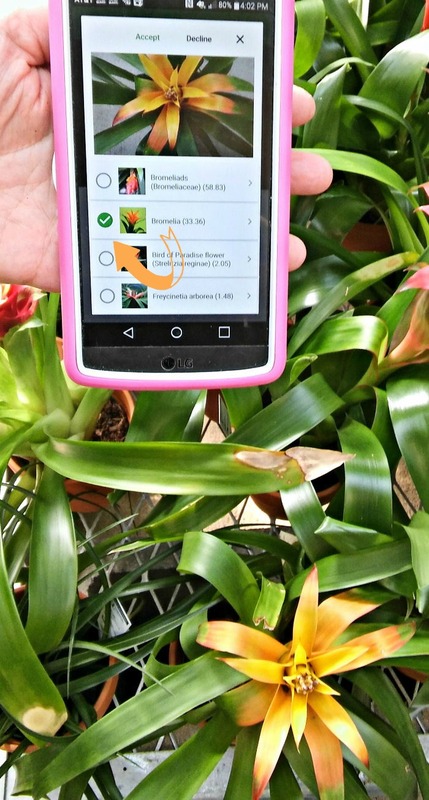 Instead of using the camera feature, PlantSnap will also allow you to switch to the gallery view to identify photos of plants that you have already taken. This makes it handy when you don’t have the time to use both the app and the camera, and allows you to do the identification step later when you are home. The details page of the identified plant allows you to zoom in for more detail. 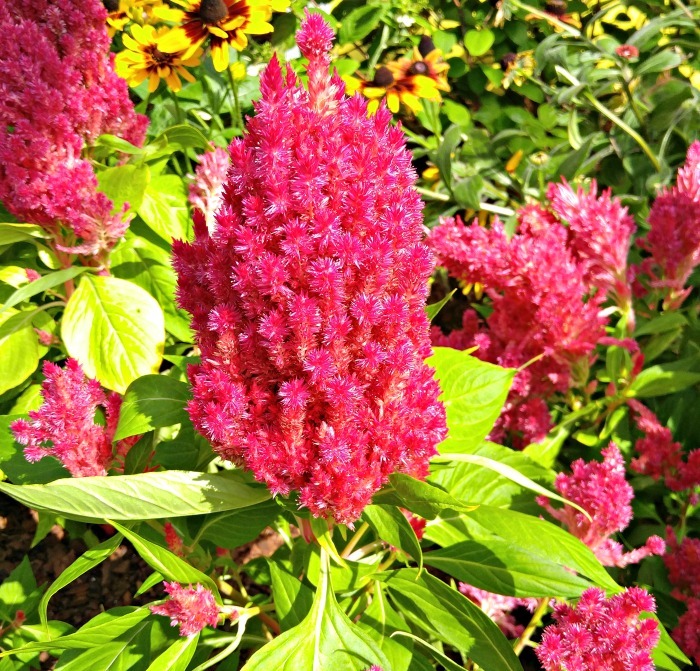 Just click on the photo and use your fingers on the enlarged image to swipe to see a close up of the leaves and flower details. This will really help with the identification process, and allows you to compare your photo to theirs. The details page also has a link to the plants entry on Earth.com where you will discover additional information about the plant. One of my favorite features is the feed that PlantSnap creates from the plants I have identified with the app. This makes it really helpful later when I want to write blog posts and don’t have to refer to my notes, but have both the photo and the name of it right there in the app for me to use. The app also gives details of where and when I took the photo. This is a BIG help for me when I have hundreds of photos from various garden centers to write about! And I I LOVE that I can transfer photos from my feed directly to my computer with just my phone charging cable! 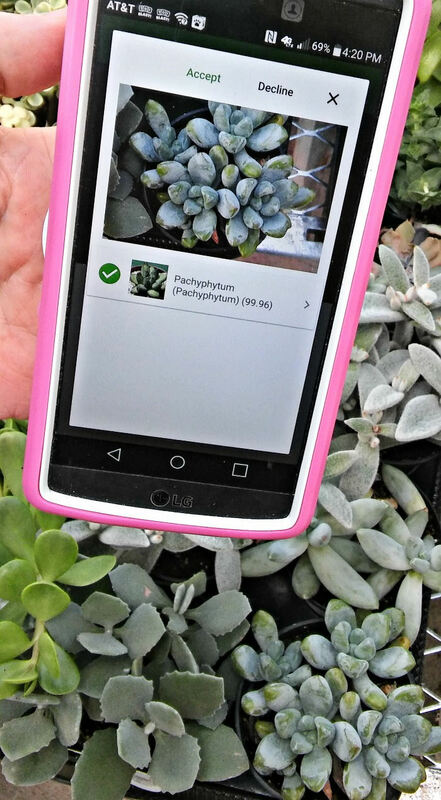 Getting extra details on each plant is as simple as clicking on its name in the app to see more information. There is even a setting to see what is trending on the app. Just click on this and it will show you the plants and flowers that are the most often identified recently. 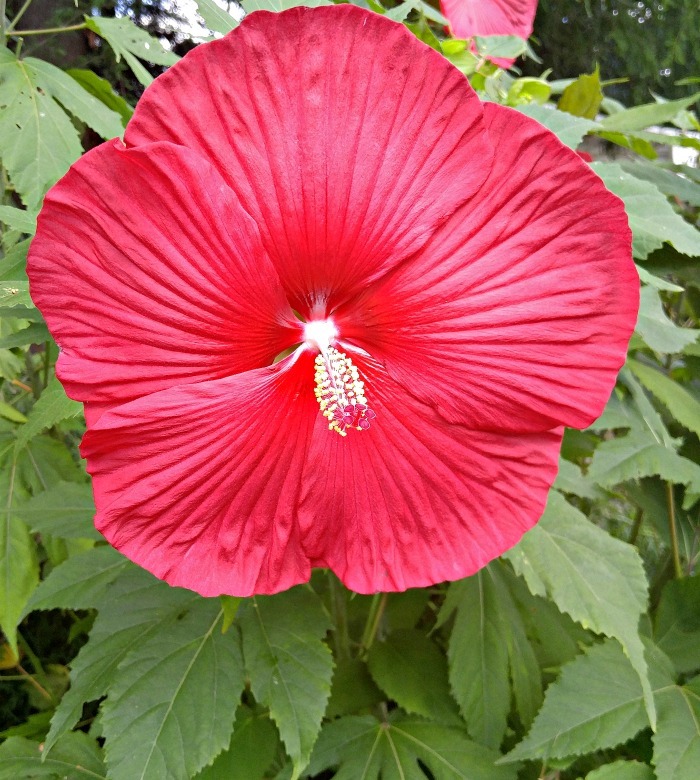 Who knew that Hibiscus, Moon Orchid, Oakleaf Hydrangea, Coneflower and Garden Phlox would be ones that needed identification right now? One of my favorite new things to do is to use the app on my daily walk. I came across a neighbor’s prickly pear cactus the other day, just about to flower. 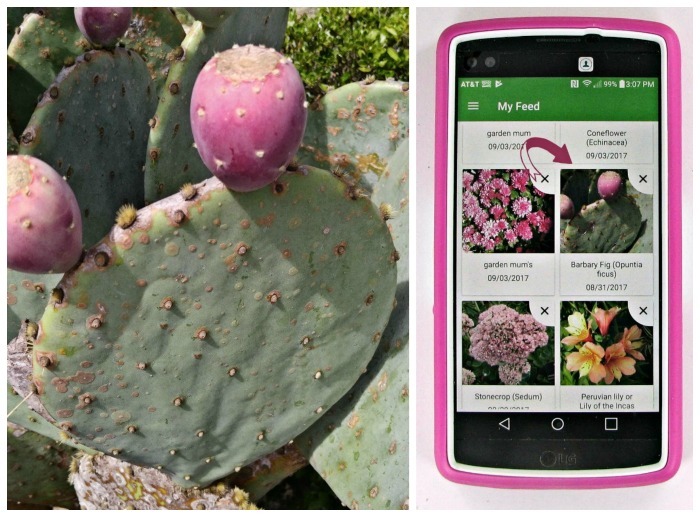 Out came my app and in seconds, I had the photo and name – “opuntia ficus” in my feed! I gave this app a very good work out. I took photos in my garden, in Botanical garden centers during my trip, around my neighbor’s gardens and I even took it to a large garden center to see how it identified their plants! The hardest part for me to get a good grip on was the photo taking. The app definitely does its best identification if the plant is isolated from others and if I can get both the leaf and the flower in the picture frame. 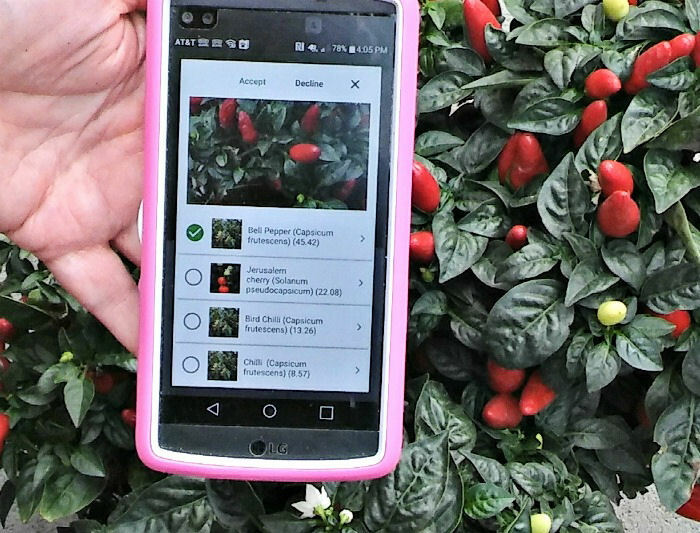 This can be a challenge, since many plants are grown with others near by and it’s hard to not confuse the app with other plants in the photo frame. I loved that it would give me the name of different succulent plants when I was in a garden center. Most of the succulents at my local center have the lovely name “succulent” which tells me nothing! PlantSnap identied many of them with ease. I also tested the app on foliage plants with no flowers, but did not have as good a success with this. I don’t know whether it was because the app is more flower plant based, or whether my picture taking skills were at fault, but the success rate was not as high for me with simple foliage plants, although it did identify many of them. The ability to suggest another name is a plus in cases like this. By far, the best results came when I tested a flower and was able to have the leaf in the frame. The identification rate of doing this was very high which pleased me since flowers are my main interest. 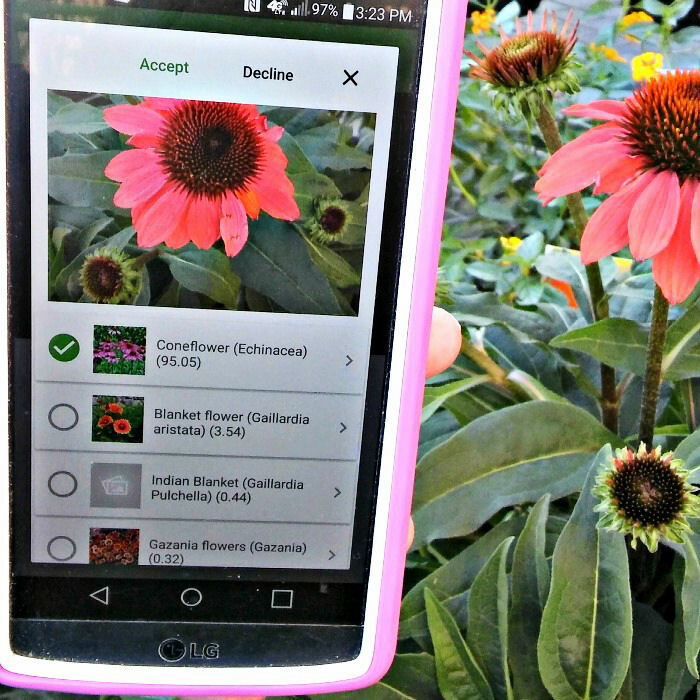 The PlantSnap app will often give several variety names. For this test, I chose a bromeliad plant and the top suggestion was bromeliad, but I chose the second name “bromelia” since the leaves and flower looked more like my photo. 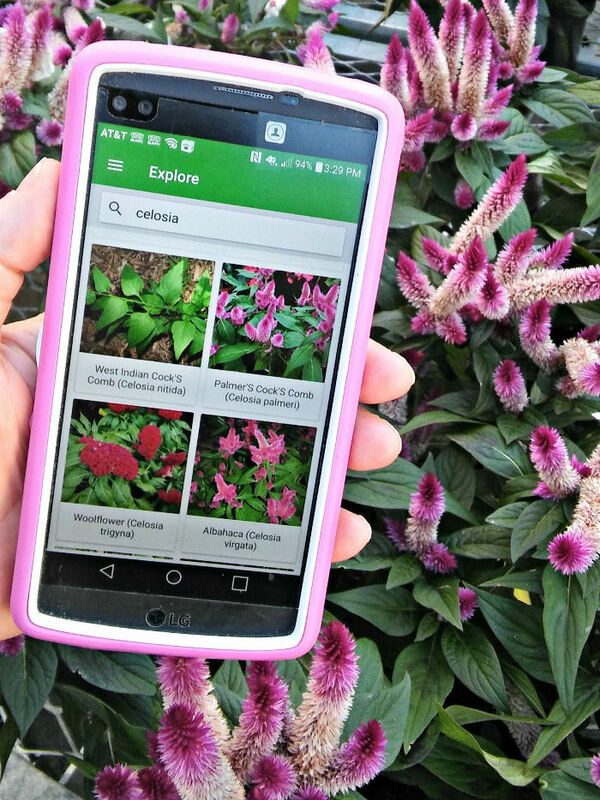 Even though the app has a comprehensive data base, occasionally, you will find plants that are not yet listed. In this case, you will be given a list of possibilities. Just click on accept if you agree with the name, or decline of you don’t. If you choose decline, you will be given the option to enter a name so PlantSnap can use this for future reference and identification. I was surprised that garden mums didn’t identify correctly, but I think it is because there were too many flower heads in my photo. Remember, the right photo is the key. I added the name garden mum and it was accepted. How Accurate was the PlantSnap Mobile App for me? The accuracy of the app depends entirely on the photo that is taken. If you try to use it with blurry photos that are not well cropped and contain several plants, you won’t be happy with it. But if you take the time to center your photos well, and to include a close up of the flower and leaves of the plant, it does a darn good job. I was able to correctly identify most of the plants that I took photos of. For me, PlantSnap had the highest success rate identifying flowering plants but did not do as well with foliage plants or herbs. I feel that it is very worth the small purchase fee (with no ads!) and know that I will use it often in future. PlantSnap gives you instant access to a huge Plant Database that is constantly learning and adding information on new plant species. 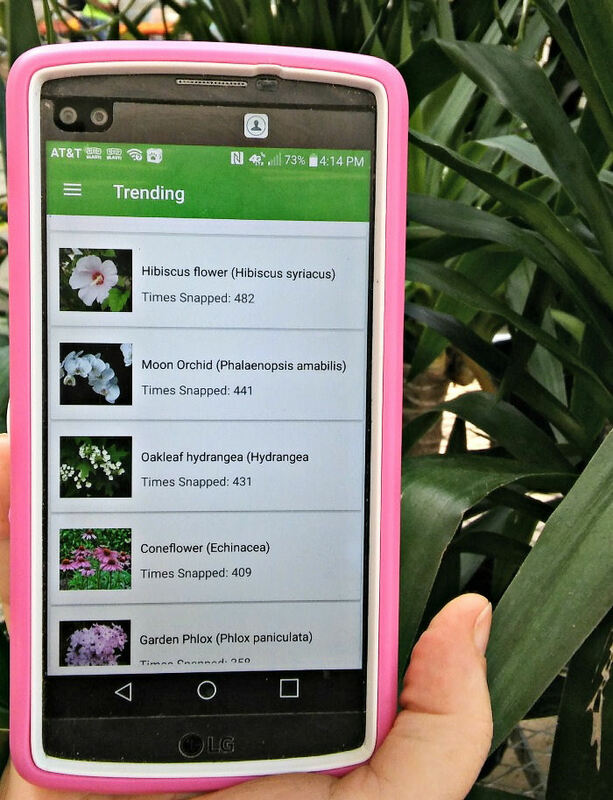 One great feature of the app is that PlantSnap updates automatically for you every time they add a new plant species, with no additional fees required! Another thing that I love about the application is the ability to reject the name it suggests in favor of another. With more and more people using the app, I suspect that the results will get better and better as time goes by. Interested in finding out more about the application? Visit PlantSnap for more details. You can download the app in Google Play or the App Store. Finally here is a handy video showing how to easily use the PlantSnap mobile app. It is amazing the apps available now! Now this is a genius idea! There is a lot of times that I will wonder what a certain plant is. Especially when I’m on vacation I am very curious about different vegetation. I found it so helpful on my trip! It’s nice to have the plant id in a few seconds! I need this app! I always look around at flowers and plants when we are out and about, and wonder what they are. It is a genius idea! This happens to me all the time! Until my mom passed, I would call her and now I’m always wondering what a plant is so this app will really come in handy for me. 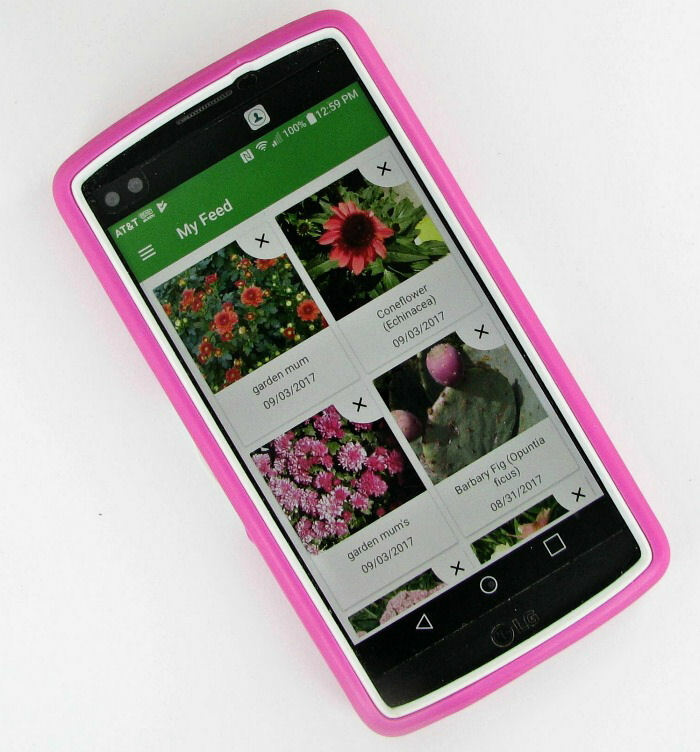 A plant app in memory of your mom! I was delighted to get a chance to test it! Now that is an awesome app – I am awful with flowers and always asking what’s this or that, so this would be perfect for me! Now if they could develop a weed app! There are times I am in my garden and I fear pulling up the wrong thing. Even though i am “older” I am new at gardening. Thanks for this wonderful tip, I will purchase this one. Funny you should say that Mary. I thought the same thing while using it! This is so neat! I need something like this. I never know what kind of plants or flowers I’m looking at. I find that often myself. It was a big help! I really enjoyed testing it. This is such a cool app. What a great tool for identifying plants you want to know more about. This is a great idea. I have a purple plant that we’ve been growing since spring but we have no idea what it is. The leaves are purple and that is it. I need this app to tell me what it is. This is so cool! I definitely don’t have a green thumb but I can’t help but admire the flowers! I have needed this for years! I’m a nature lover but there are many plants I come across that I would love to know more info on. This is a brilliant idea for an app! What a neat idea. I’m sure it would even be helpful when hiking and not sure if you come across poison ivy or such. What a fun app! I can definitely see myself using this quite often! No more searching Google with super broad (and quite terrible) search terms such as “pink flower with serrated leaves” or “variegated color, annual but only in zones 10-11” haha! Yes! I’ve been looking for an app like this and everything I’ve found so far does not do what I need it to. This mobile app looks so interesting. I really need this app! I always to taking picture of the plants and especially the flowers. Will downloaded this app right now!! Wow! I didn’t know there was an app out there like this!! I need to let my mom know she loves her plants. NO WAY!!! Earlier this summer I was wondering if there was an app like this! I really was curious about some plants! I can’t believe there is!! How cool! Have you asked for a botanist’s ID? If so have you had success and is there a charge for these requests? Thank you! Hi, does this app also provide care instructions? For example, how often a certain plant needs watering, or needs direct sunlight etc? Can plantsnap identify diffrent strains of marijuana? I have no idea. I have never seen it growing to try it.